This is beautiful. I had so many complaints. Yes i would recommend this. 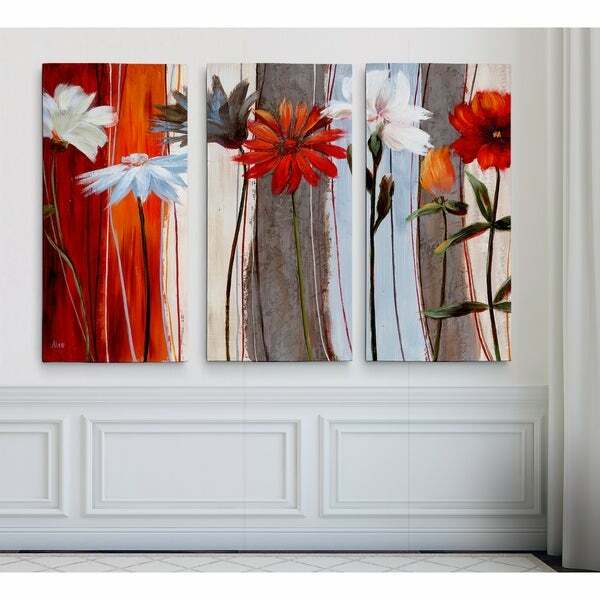 Spring Debut -Gallery Wrapped Multi Piece Canvas A premium hand wrapped Giclee canvas. 100-percent Created to last. Individually hand wrapped to very high standards. Printed and inspected one at a time utilizing the latest archival UltraChrome Giclee inks Available in 3 sizes for you to choose from 24"X36" TOTAL SIZE - Consisting of 3 Total Panels Each measuring 12"x24" x1.5" deep 32"X48" TOTAL SIZE - Consisting of 3 Total Panels Each measuring 16"x32" x1.5" deep 40"X60" TOTAL SIZE - Consisting of 3 Total Panels Each measuring 20"x40" x1.5" deep Each piece includes hanging accessories and is ready to hang. You need only to apply an anchor to the wall of your choice. Beautiful artwork. Delivered as ordered,on time and as promised. Colors are stunning and true to the pictures. Looks beautiful in my living room as an accent. Perfect choice.